A team of researchers from the U.K., Germany and Russia has found evidence of magnetism at the edges of graphene. In their paper published in the journal Nature, the researchers describe how they made their discovery and why they believe it is important. 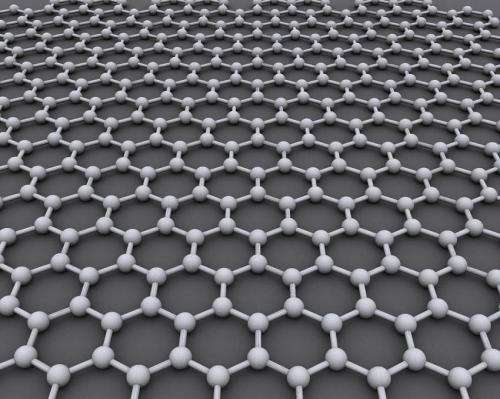 Graphene is, of course, a 2-D layer of carbon atoms forming a sheet. A lot of research has been conducted into its unique properties seeking novel applications. One such possibility is using it to build a truly quantum computer. But that idea has been held back by the inability of researchers to take advantage of theorized magnetism on the edges of graphene sheets. In this new effort, the researchers report that they have found a way to overcome this hurdle. Prior research has shown that a possible way to induce magnetism at the edges of graphene sheets is to have them arrange in a zigzag shape. But that was easier said than done due to the difficulty in getting graphene to conform to such a shape while simultaneously preventing defects. To overcome this problem, the researchers followed the lead of a team that found synthesizing graphene in a chemical solution could produce sheets in uniform shapes. The team adopted this technique, and after modifying it, found that they were able to create nanoribbons with uniform zigzag shapes. As part of the technique, they also attached magnetic nitronyl nitroxide molecules to the nanoribbons at edge sites. The researchers report that their technique resulted in chemically stable graphene nanoribbons that were strong enough for testing theories surrounding their possible magnetic properties. And in addition to showing that magnetic edge states do exist on graphene edges, the team was also able to measure the strength of the spin-orbit of the coupling present in the material. They were also able to measure how long it took for the spin rates to reach equilibrium and to lose coherence. Notably, the decoherence times were approximately one microsecond, which was good news, because some researchers had feared it might be too short to be useful. The team reports that they were also able to show that electrons at the unpaired radicals interacted with the edge spins.